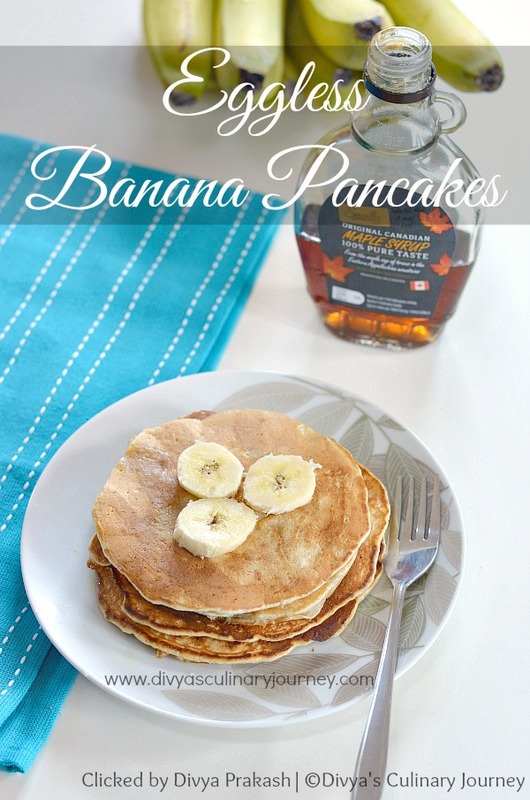 These soft and fluffy pancakes are made with ripe bananas. These pancakes does not require eggs. Ripe Bananas : 2 nos. Mash bananas well and keep it aside. In a bowl, sift together all purpose flour, baking powder, baking soda, cinnamon powder, salt. To this add milk little by little and and mix. Now add the sugar, melted butter and vanilla extract and mix well.Finally add the mashed banana and mix the batter such that it is well combined.Now the pancake batter is ready. Heat a griddle and spread butter. Now pour a laddle of batter onto the hot griddle and cook till bubbles are formed. Then turn it to other side and cook for a minute. Remove from the heat. 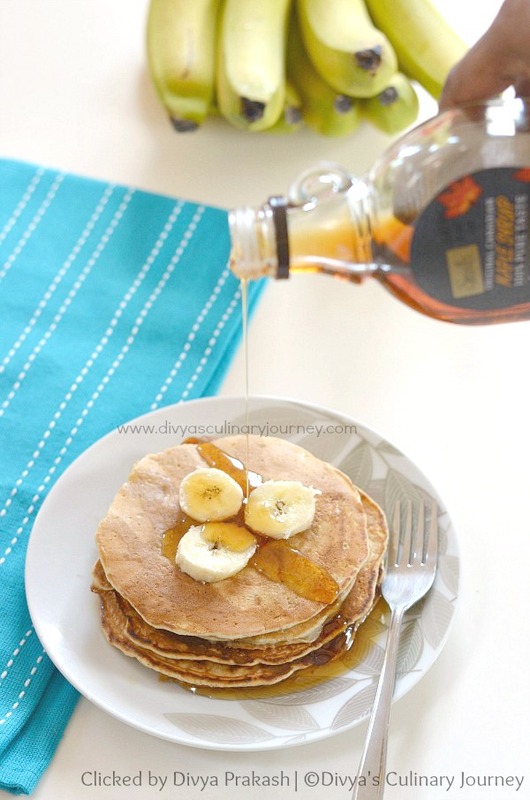 Stack the required number of pancakes, drizzle with maple syrup and enjoy your breakfast. Instead of milk, you can add butter milk too. Additionally you can add some chocolate chips to the batter, kids will love it. I served the pancakes with maple syrup. You can also serve it with honey or chocolate syrup as per your preference. We make eggless pancakes sometimes. They're really good. We first started doing it because we had run out of eggs. Oops! These banana ones sound really yummy! Will have to try them! I see what you are doing there...the banana instead of the egg! How interesting! Even without eggs they are light and fluffy...super yum. These pancakes look perfectly delicious! They look so light & fluffy! I love the idea of the bananas in the batter. Must try these. What a great way to start your day! I love bananas! This is a good recipe to have on hand since 75% of the time I am out of eggs.